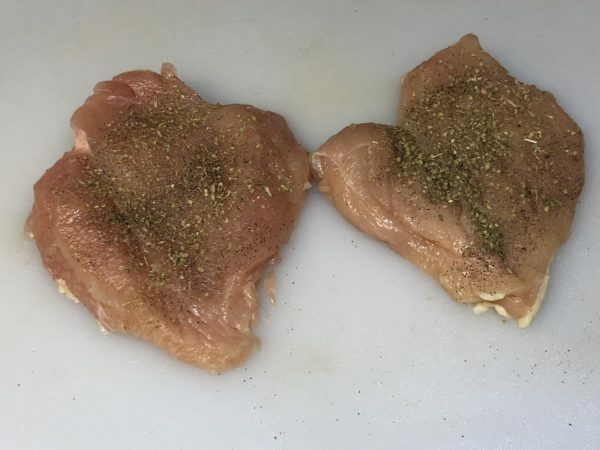 Looking for a new Spinach Stuffed Chicken recipe using the Air Fryer? 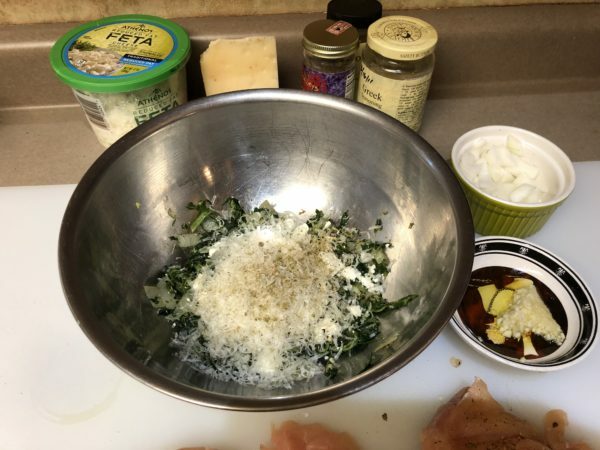 This Spinach Stuffed Chicken Breast with Greek flavor is perfect choice. 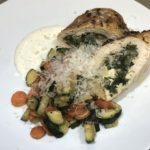 The Spinach Stuffed Chicken Breast only takes 20 minutes in Air Fryer with moist flavorful Greek profile. Key is to use Cavenders Greek Seasoning in stuffing and on chicken breasts. 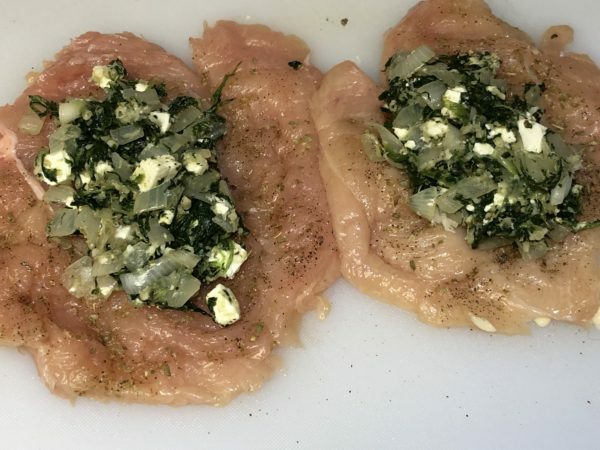 Greek style spinach filling stuffed into chicken breasts that only takes 20 minutes in the Air Fryer to make. 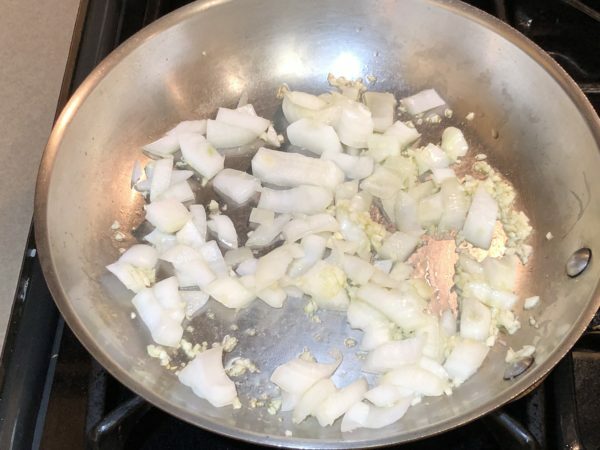 Sauté onions with mince garlic and olive oil in skillet until fragrant. This should take about 1 to 2 minutes over medium heat. 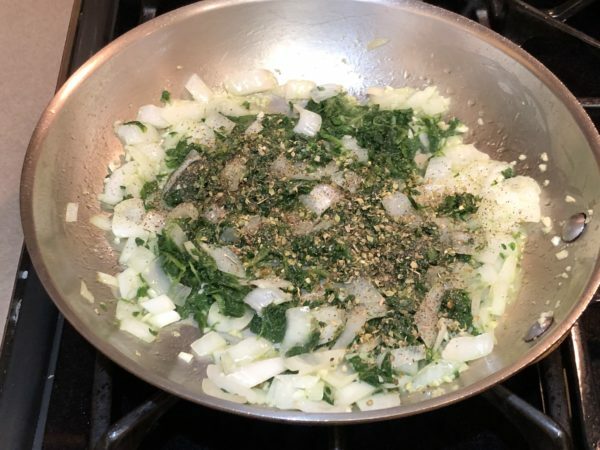 Next sauté the onions, garlic, spinach, Greek seasoning, oregano, salt and pepper with some olive oil in the same skillet. This should take about 3 to 5 minutes to cook, until the excess moisture is evaporate off the filling. Combine cooked spinach mixture with, Manchego cheese, Feta Cheese in mixing bowl. Adding some extra Greek Seasoning and Oregano, with salt and pepper to taste. Mix this filling with spatula until combined. First Butterfly boneless skinless chicken breast using sharp knife, folding chicken breast open with cut side up. Next sprinkle with Greek Seasoning, Oregano, Salt and Pepper. 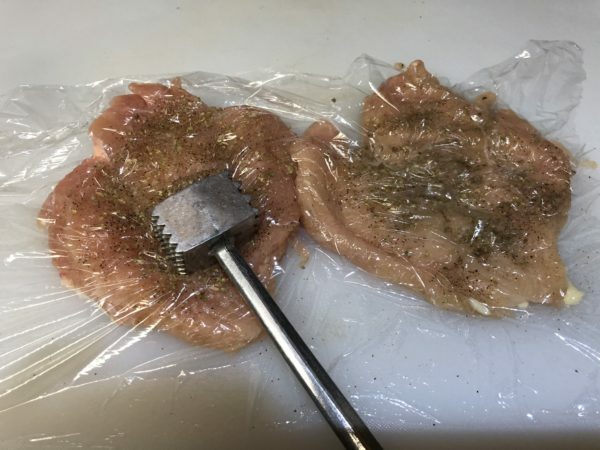 Flattening seasoned chicken breasts with plastic wrap and meat mallet. Use the flat side of mallet by pounding chicken until even thickness. Stuff each flattened seasoned chicken breast with Greek Spinach Stuffing mixture. Then carefully fold the chicken breast up covering all the stuffing. 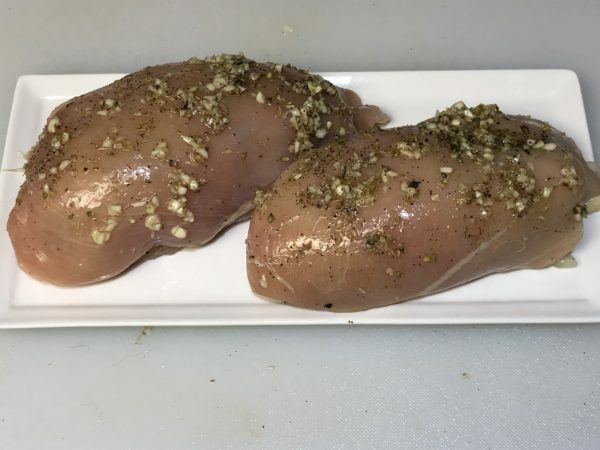 Rolled Stuffed chicken breast, sprinkle with Greek Seasoning, Oregano, Kosher Salt and Black Pepper. Spray with Olive Oil using EVO Sprayer to get an even coating of Olive Oil over all the chicken. Placed the Spinach Stuffed Chicken Breasts carefully into basket of the Air Fryer. 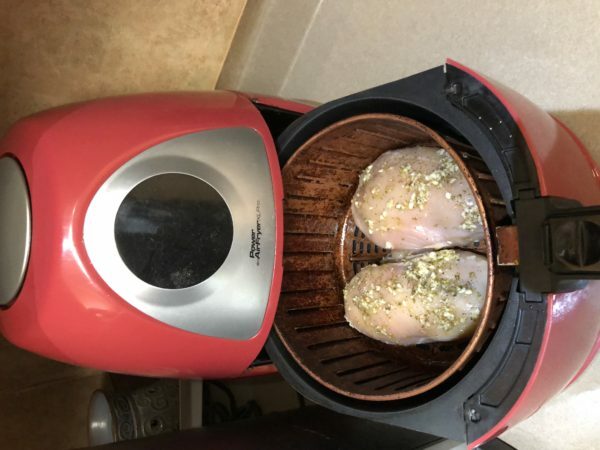 Set the Air Fryer to chicken setting. 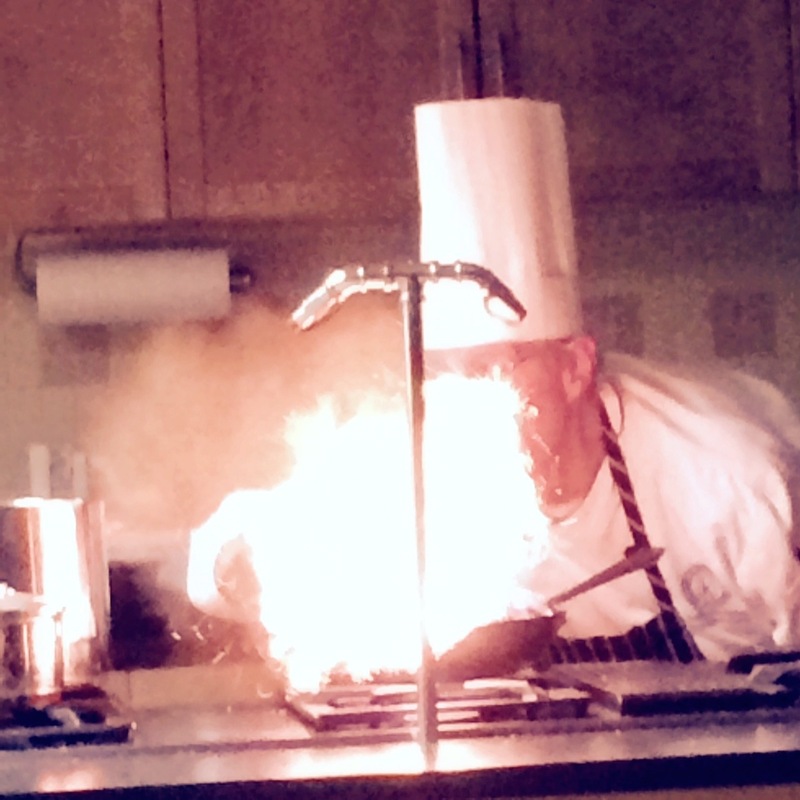 Using the PowerXL default setting 20 minutes at 350°F. 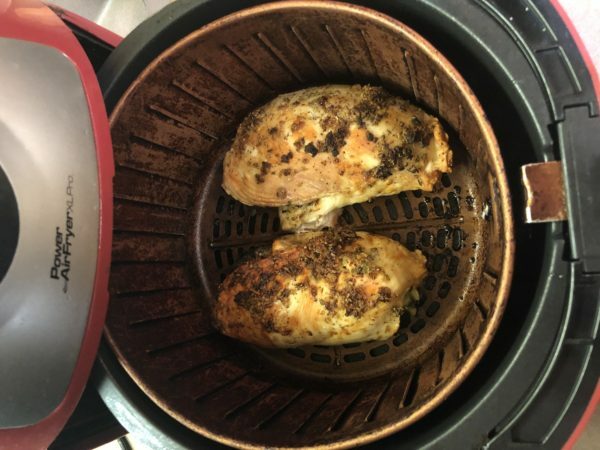 Air Fried Spinach Stuffed Chicken Breast coming out of Air Fryer. See that wonderful golden brown color, that’s still in the Air Fryer basket. 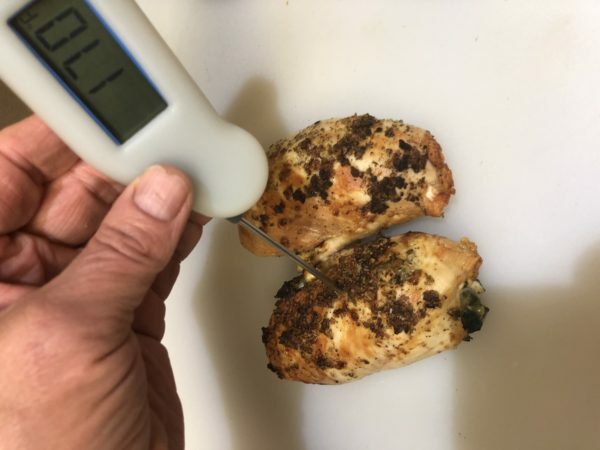 After air frying spinach stuffed chicken breasts, be sure to check the internal temperature. The thermometer should read 170°F. Be sure to stick the probe right in center of the stuffed chicken to make sure the filling reaches 170°F. 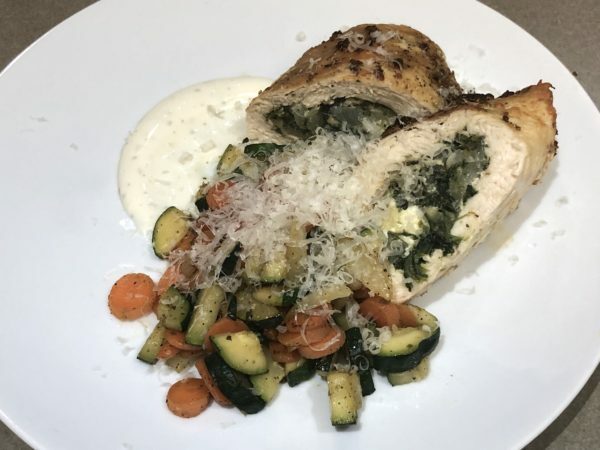 Allow the Spinach Stuffed Chicken Breast to rest 5 minutes. Next cut each of breast in half on a diagonal. Place cut chicken breast onto plate in attractive manner. Try using Ranch Dressing as sauce smeared onto plate. Finally place your choice of cooked vegetables onto plate. Garnish with Manchego Cheese and Enjoy.